Five people were detained, a foreigner who is deemed to be the mastermind is at large. On 4 March, operatives detained three persons believed to be involved in the attack on the Hungarian culture centre in Uzhhorod on 27 February. One of them was detained in Cherkasy, the other two in Kropyvnytskyy, National Police chief Serniy Knyazev has said. He added that police have identified the likely mastermind of these attacks and put this person on a wanted list. "Earlier, Transcarpathian police officers identified Polish citizens involved in the 4 February arson of the centre. Polish law enforcers detained them in Warsaw. A court in Poland placed them in custody for 90 days. The issue of questioning them is being decided now with the help of the Prosecutor-General's Office," Knyazev said on Facebook. Thus, the National Police concluded the probes into both attacks on the Hungarian centre. "Overall, five people were detained, a foreigner who is deemed to be their mastermind is at large," he added. 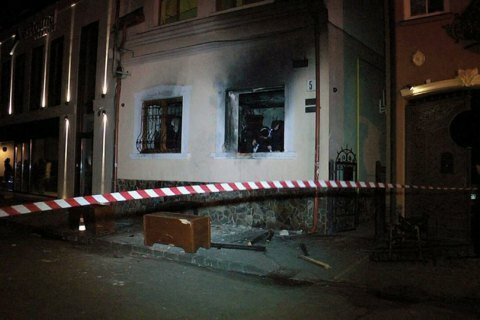 As reported earlier, the Poles suspected of setting the Uzhhorod Hungarian culture centre on fire on 4 February were detained in Poland on 21 and 22 February. The Transcarpathian police said two of them may be involved with the Polish far-right group Falanga.